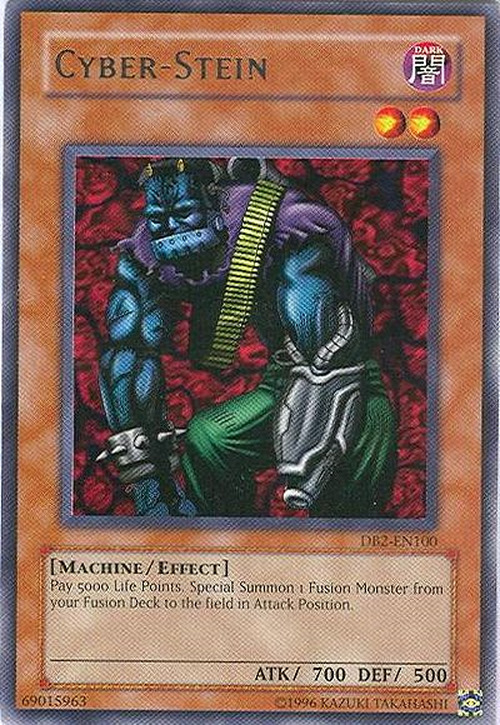 Cyber-Stein and its Japanese name, meaning Devil Franken, both reference Frankenstein's monster, which this card is based on. Magical Scientist bears some similarities to this card. Both of these cards are Forbidden due to being able to summon Fusion Monsters at the cost of Life Points, which led to the creation of an OTK/FTK Deck in the past. In addition, they are both low-Level DARK Monsters(This card is Level 2, while Magical Scientist is Level 1), and have some sort of relationship with the Mad Scientist trope. In addition, Cyber-Stein has a double-barreled shotgun strapped on its back. This is a reference to the shotgun Victor wielded on his honeymoon when the monster threatened to kill his wife Elizabeth. This card's OCG name, which translates to Devil Franken, is a reference to when Frankenstein's monster reads the book, Paradise Lost, and identifies with the protagonist, Satan. This monster also shares a common naming convention with another monster based off of Frankenstein's monster - Number 22: Zombiestein. In the OCG, their names contain Franken (the Japanese name of Cyber-Stein is Devil Franken and Zombiestein is Fran Ken) while in the TCG their names contain Stein instead. This monster appears in the artwork of Tour Bus To Forbidden Realms. If one looks closely at this card's artwork, Cyber-Stein is shown to have a double-barreled shotgun on his back, making it one of very few cards with controversial artwork that has not been censored in the TCG. Before Upperdeck Day only 18 copies of the SJC-EN001 card existed in the world. $20,000 USD was bid for a Cyber-Stein SJC-EN001 card on eBay, but the bidder didn't pay. The card was eventually resold for approximately $7,000 USD. In more recent years a few copies have surfaced on card single websites for as low as $400 USD. In the OCG, this card was Forbidden for sixteen formats before being Limited once more, which was the most of any card before it was surpassed by Raigekis twenty-four in the TCG. This card has the largest static LP cost of any card in the game. This is one of only two Shonen Jump Championship Prize Cards to be banned, with the other being Crush Card Virus. Coincidentally, both were printed as a Rare card in Dark Beginning 2 and Turbo Pack: Booster One respectively. Before Shrink was printed as a common, this was the lowest rarity a Shonen Jump Championship Prize Cards was printed. Fusion Monsters are Special Summon monsters, so they can be Special Summoned from the Graveyard by effects like "Monster Reborn" only if they were Special Summoned by the correct procedure at one time, and then sent to the Graveyard. Suppose an effect like that of "Gale Dogra" sends a Fusion Monster directly to the Graveyard, or an effect like that of "Cyber-Stein" Special Summons the monster without Fusion Summoning. Then "Monster Reborn" cannot Special Summon that Fusion Monster from the Graveyard, since it was not properly Special Summoned to the field. : Can an effect like that of "Monster Reborn" Special Summon a Fusion Monster from the Graveyard? While "Koa'ki Meiru Drago" is on the field, the effect of "Cyber-Stein" can still be activated but you cannot choose neither a LIGHT nor a DARK Fusion Monster to Special Summon. : When the effect that prevents the Special Summon of LIGHT and DARK monsters of "Koa'ki Meiru Drago" is applied, can "Future Fusion" be activated? Barrier Statue: You cannot activate “Future Fusion” or the effect of “Cyber-Stein” while a Barrier Statue is in play if the only Fusion Monsters in your Extra Deck have barred Attributes. Chthonian Polymer: You can only activate this card when the opponent Fusion Summons a monster, including with a Special Summon that is treated as a Fusion Summon, like “Miracle Fusion” or “Power Bond”. You cannot activate it when they Special Summon a Fusion Monster with a card effect, like “Metamorphosis” or “Cyber-Stein”. Cyber End Dragon: You can Special Summon “Cyber End Dragon” with “Cyber-Stein” or “Metamorphosis”. Cyber Twin Dragon: You can Special Summon “Cyber Twin Dragon” with “Cyber-Stein” or “Metamorphosis”. Non-Fusion Area: You can still Special Summon a Fusion Monster with a card effect like “Metamorphosis” or “Cyber-Stein”. UFOroid Fighter: If “UFOroid Fighter” is Special Summoned with “Cyber-Stein” or “Metamorphosis”, its original ATK & DEF will be zero.